Yesterday I quoted from Gen. Thomas Gage’s proclamation on 12 June 1775 declaring martial law in Massachusetts. Since at the time Gage controlled only the peninsula of Boston and Castle William, that proclamation didn’t have a big effect in the province. 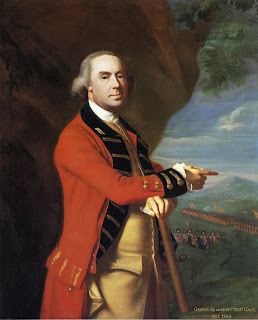 A couple days later, he and his generals started planning to take the Dorchester and Charlestown peninsulas as well, but few people were living in those areas, either. In this exigency of complicated calamities, I avail myself of the last effort within the bounds of my duty, to spare the effusion of blood; to offer, and I do hereby in his Majesty’s name, offer and promise, his most gracious pardon in all who shall forthwith lay down their arms, and return to the duties of peaceable subjects, excepting only from the benefit of such pardon, Samuel Adams and John Hancock, whose offences are of too flagitious a nature to admit of any other consideration than that of condign punishment. And to the end that no person within the limits of this proffered mercy, may plead ignorance of the conseqences of refusing it, I by these presents proclaim not only the persons above-named and excepted, but also all their adherents, associates and abettors, meaning to comprehend in those terms, all and every person, and persons of what class, denomination or description soever, who have appeared in arms against the King’s government, and shall not lay down the same as afore-mentioned, and likewise all such as shall so take arms after the date hereof, or who shall in any-wise protects or conceal such offenders, or assist them with money, provision, cattle, arms, ammunition, carriages, or any other necessary for subsistence or offence; or shall hold secret correspondence with them by letter, message, signal, or otherwise, to be rebels and traitors, and as such as to be treated. Those passages appeared in italics in the printed proclamation, presumably to signal that Gage really, really meant it. This proclamation is also significant in what it doesn’t say. It offers no financial reward for Hancock and Adams, or any other Patriot leader. In the 1800s it was common for American authors to say that the British Crown had promised £500 for the capture of Hancock, Adams, and sometimes other men. Some authors say that offer came in early 1775, others in early 1776. But as far as I’ve seen, there’s no evidence the Crown ever offered such a reward at all. None of those authors cites a document to back up the claim. Gov. Francis Bernard offering up to £300 for information after the anti-Stamp Act riots of August 1765. Gov. Joseph Wanton offering £100 for information on the Gaspee attack in 1772. George III offering £500 for information on the same event. TOMORROW: John Hancock’s famous signature. "Flatigious." Not hearing that a lot these days (in fact, my Web program has underlined the word to show that it must be misspelled). Well, there's the trouble. Thank you.